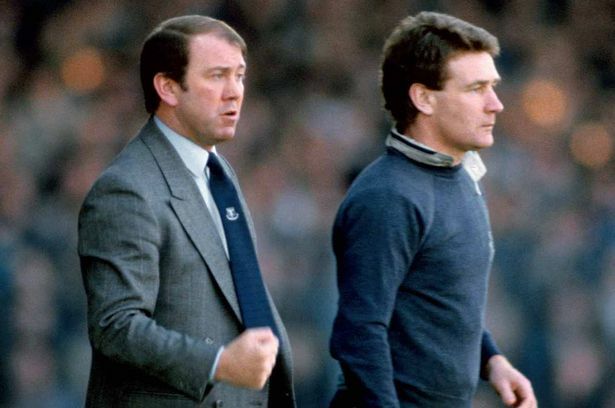 In front of 27,860 fans at Goodison Park league champions Everton had to settle for a share of the spoils with Brian Clough’s Nottingham Forest. After a goalless first half the second half was a lot more entertaining with both sides searching for a vital 3 points to propel them back into the title race. It was not to be however as Nigel Clough and Paul Bracewell goals ensured it was to be a point apiece. Everton stay 6th but close the gap on leaders Manchester United by a point after they were surprisingly beaten 3-0 at Filbert Street by relegation threatened Leicester City. The Daily Express provided a brief report on the game. Everton’s uphill task in keeping their title was made a little steeper by a Forest side bearing the ominous Clough stamp of a new generation of honours challengers. Two hours before kick-off, Clough’s son Nigel was a non-starter with ankle trouble. But squad injuries forced him to play and he opened the scoring after a brilliant build up involving Colin Walsh, Peter Davenport and Stuart Pearce. But Everton hit back to salvage a point in the 71st minute when England midfielder Paul Bracewell blaster the equaliser from a precise Kevin Sheedy corner. Everton XI: Southall, Harper, Van Den Hauwe, Ratcliffe, Stevens, Heath, Steven, Lineker, Sharp, Bracewell, Sheedy. Next Post Whatever happend to Stefen Rehn?